BRAZILIAN BLOWOUT IS THE PREFERRED SMOOTHING TREATMENT OF CELEBRITIES, BEAUTY EXPERTS, AND STYLISTS AROUND THE WORLD! 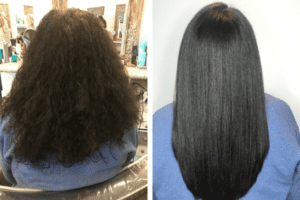 Through the use of breakthrough bonding technologies, these customizable smoothing treatments actually improve the condition of the hair by creating a protective protein layer around the hair shaft to eliminate frizz and smooth the cuticle. The end result is smooth, frizz-free hair with radiant shine! So if you are over the Monsoon Frizz and want shiny, hassle free hair, this service is for you!